Each of us can, and must eventually, become a law unto himself: each having that Divine Power latent in him and being linked vitally with the great Cause, Source, and Center of life, — linked consciously, if he eliminates fear and all other pessimistic thought and feeling. For there is within us always a grand inspiration — a breath and force from the Innermost, which no limitations nor yardstick ideas nor intellectual criticisms can touch. It may be called the Love of the Supreme; for it is a royal compassion which is the heart and essence of all existence. To gain the knowledge that would save him, a man need not open any book nor once lift his voice in prayer, nor wait to be born again or forgiven by any personal god; nor reach out in any way for help from outside himself. It is himself who must forgive himself: resting in the Law that controls all life; falling back in confidence upon the stronger, the eternal side of himself; holding himself through imagination in divine realms of thought; feeling himself a part of the everlasting beauty. 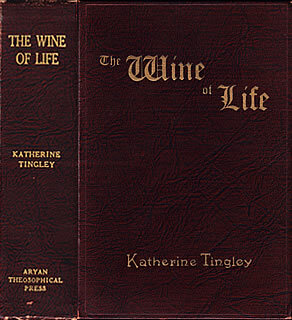 Katherine Tingley's first book, published in 1902, three years after she moved the International Headquarters of the Theosophical Society to Point Loma, California. 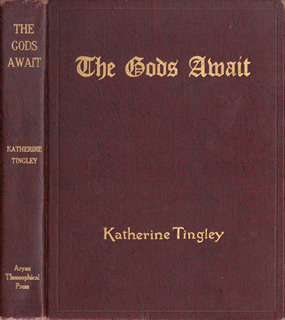 Katherine Tingley said that it was time for the history and teachings of Theosophy to be presented in a new way, adapted to the average mind and the new time. 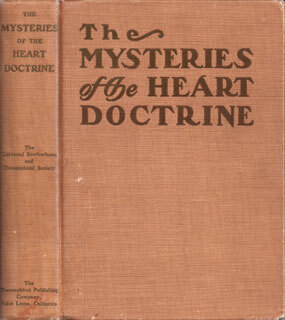 The book was outlined by her to contain some of the vital teachings of the Heart Doctrine – the Wisdom Religion, Theosophy – and also a record of some of the facts, many hitherto unpublished, of the history of this now world-wide Movement. She carefully selected subjects which she felt were best adapted to the present needs of the world (see Contents), including short sketches of the lives of H.P. Blavatsky and William Q. Judge. Excerpt from chapter "Theosophy for the Young"
Who am I? Where did I come from and how did I get here? Why don't we see the wind? What makes the grass grow? What does "forever and ever'' mean? What makes the flowers and insects die every Autumn and then come back to us every Spring? What is the moon? Where did the stars come from? What is the sun? What is God? The child of three or four never concerns himself about the style of his garments, or the price of coal, or the last election. His questions force us to believe that this little Pilgrim Soul intuitively divines the nature of the journey before him and therefore asks for spiritual knowledge, the only compass that can guide him through it. "The Soul knows what it requires," and it is therefore the most important thing in the world that these early mystic questions of the child be answered rationally. Why is this important? Because the child is a soul, a warrior, early destined to enter that battle which we call life. Shall that divine Warrior-Soul express itself in the street fight, in business "competition", in "professional jealousy" — the curse of the world of art? Or shall the Warrior do battle with the lower personal nature, that elemental self which is harder to conquer than it is to take a city? It all depends upon the ideals given to a child during the earliest years of life; and that he looks to us for spiritual, high ideals his questionings clearly indicate. 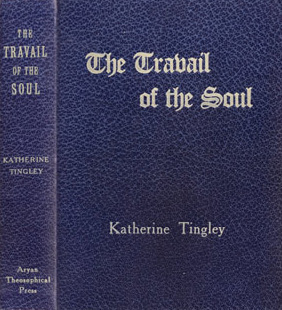 "Give me a child until he is seven," said Katherine Tingley, "and not all the temptations of the world can move him afterwards, for he will have learned the divinity of his own soul." ... Those who see in life only a riddle, who see injustice on every hand, who cannot find peace of mind without some satisfying answer to the ancient questions, Who am I, Whence came I, and Whither do I go, who have touched the great problem of sorrow and would gladly make their lives count in service to their fellows if only they could find the way — such as these it is believed will find much to inspire and help them in the appeal made in this little volume. ... Optimism, service, common sense, action rather than talk, the magic of self-directed evolution, love as the great unfolding power in life, and the abiding consciousness of Divinity, pouring through all and over all and in all ... these are the keynotes of Theosophy, and are accentuated here. 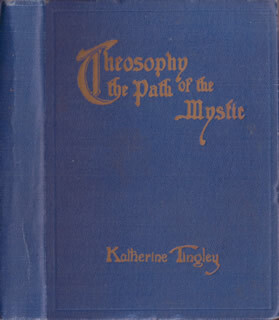 I have issued this book in response to the insistent requests of many of my friends and followers; and the name that I have chosen for it is one that I have had in mind for many years as being a fit and appropriate title for a printed collection of some of my Theosophical Lectures, delivered at various times and in various places in the United States and Europe. The Lectures or Addresses that I have chosen out of hundreds, for printing together under the title "The Travail of the Soul," seemed to me to fall naturally under that name; because they all deal with different phases of human suffering and error, out of which I have endeavored to point a sure Path leading to Light and Peace; and this Path is the eternal Way of the Spiritual Life. There is no other true Path, for it is the Path of Wisdom Unbounded, of the Light of Eternity, and of Ineffable Peace. The Lectures are printed practically in full and almost verbatim from the stenographic records. 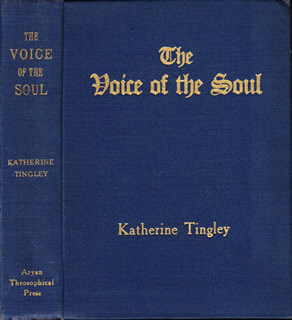 I have just finished reading the proofs of Katherine Tingley's latest book, The Voice of the Soul, and even more than all the others of the present Theosophical Teacher's works, does this book impress me with its deep and tender pathos and its striking imagery of thought. Good books are so rare; helpful ones rarer still; rarest of all, perhaps, are books like this one in which a truly sublime teaching is given without any pretense whatsoever towards a usage of those artificial and meretricious literary formulae which offend more often than they please. Great thoughts need no artificial ornamentation. 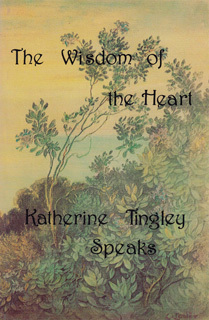 Jewels of the soul have their own inner fire, and sparkle with that divine light which springs from the inner fount of man's spiritual being; and I think that this characteristic of unspoiled beauty is the noblest literary form, and I recognise that this, Katherine Tingley's new book, has it. A compilation of public addresses, delivered in 1923 and 1924. To the world's conscience every humane mind must appeal in this hour of the world's dilemma. War is a symptom – the effect of an inner cause that began ages ago among those who were yet the creatures of inborn savagery – having its sole origin in human selfishness, or fear, or both. Hence its cure and abolishment lie not in conferences more or less sincere or insincere, but in a radical regeneration of the human heart — "a change of spirit." This cure is the easiest thing in the world. It is not difficult, nor far away, nor impracticable, but actually is the most real and most ardent wish and desire of every normal man and woman. Nothing so stirs the masses of men as does an unselfish appeal directed equally to the heart and the intelligence. Response is immediate and universal and sincere to the last degree. War would never come and could never arise if, between nations, just complaints on the one side, and frank and honest defenses on the other side, were laid openly and frankly upon the counciltable, and a truly sincere and high-minded effort were made by sincere and honest men to arrive at and obtain a peaceful settlement of the quarrels and disputes. The party refusing to abide by such a decision or refusing to submit its arguments and its case to a tribunal, would be blackened and shamed before the entire world — a situation of affairs which no civilized nation would dare to face today. Never in any case do the people desire war. Only when men's minds are inflamed and angered by injustice – real and imaginary – does the demoniac war-fever arise with its attendant train of shameful charges and countercharges, misrepresentations and slander, hate and horrors of many kinds. Let us determine to abolish from our hearts all moral trickery, all selfish grasping and advantages, all fear of our fellow-men, and war, even all fear of war, will dissolve away as do the mists before the morning sun. Nothing is so easy, so simple. War will become impossible; for war is merely the effect, the symptom, the result, of inner moral weaknesses. 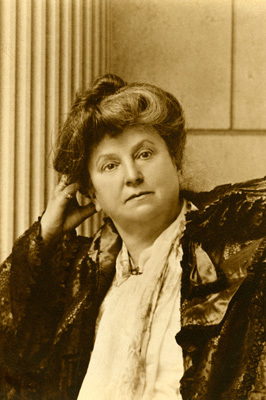 Katherine Tingley who lived the first fifty years of her life in the last [19th] century was able to understand its problems; and living in the next three decades of the 20th century she was able to do something about those problems, to expose their causes and offer a cure. What she accomplished, as we look back on those crowded years, amounts to a challenge, an adjuration, a veritable invocation to all that is highest and spiritual in man to so fill his everyday duties that the inner light to which she appealed will shine and illumine his every action. In Theosophy, she declared, we find the solution of all the problems that vex the sober thinking mind. It points the way to the right treatment of the downtrodden and outcast of humanity, and it offers the real remedies for poverty, vice and crime. It shows the fallacy of war, for which the only cure are regeneration and the application of universal ideals. It declares that unbrotherliness is the insanity of the age; that ethics are rooted in the universe; that we are responsible for all our thoughts and actions and reap only what we sow; that death has a beauty we can learn to understand, and that life after life brings that needed renewal and opportunity for growth which can see the realization of our highest hopes.